It’s here. The long awaited full-frame mirrorless camera. Photographers have been waiting with bated breath for a company to release a full-frame mirrorless camera and Sony has delivered with not one but two new cameras to satisfy those who are looking to reduce size a bit while keeping the ultimate in image quality. The A7 and A7r are very similar bodies, differing predominantly by the sensor used, with the A7 having a 24 megapixel full-frame sensor with phase detection pixels and the A7r featuring a 36 megapixel sensor without phase detection. There are some other small differences, but overall they are remarkably similar. Today I review the A7. Let’s take a look at this camera and see if the wait and the hype have been worth it. The A7 is a solidly constructed, relatively compact mirrorless camera. While larger than something like the NEX-7 or even the Fuji X-E2, it also contains a full-frame sensor and a large viewfinder. The A7 is constructed of magnesium alloy and high-quality plastics and has no flex or wobbles anywhere. The camera is tightly assembled and feels solid and comfortable in the hand. The large grip has a wonderfully sculpted finger indentation as well as a very comfortable formation for your thumb on the back. 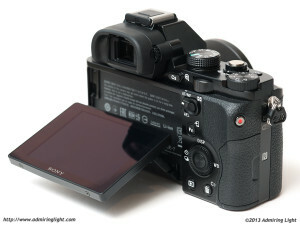 As one who did not find the NEX-7 grip to be comfortable at all, this was a great relief. The A7 feels wonderful to hold and shoot and is big enough to handle well and small enough to be a worthwhile venture away from a DSLR. The camera features dual control dials in easy reach, along with a smattering of buttons across the back and top. Most of these are easy to reach, but I found the C2 button to be frustrating to press, especially since it is used for zooming during playback, and the menu button on the opposite side requires the left hand to operate. Since it’s the only left hand button, it feels quite alone out there, and is somewhat annoying that changing menu options requires both hands. The A7 features a 2.3 million dot electronic viewfinder (EVF) at a generous 0.71x magnification. As a result, the EVF is large and clear. There is good color and contrast and low lag and noise. The viewfinder refresh can slow down in very dim light with a slower lens, but these situations are relatively infrequent. Overall, it’s probably the second best EVF I’ve used on a camera, next to the tremendous finder in the Olympus OM-D E-M1. The image of the viewfinder can be magnified by tapping on the C1 button twice, and then magnification can be adjusted using a control wheel. This works well, though I wish it didn’t require a double button press. With the image magnified, manually focusing is incredibly easy to perform, even when using very fast lenses. The A7 also features a gorgeous tilting rear display. The 3.0″, 1.2 million dot rear LCD can tilt down or up to aid in taking images low to the ground or above your head. It is limited to about a 45 degree angle when tilting down; I’d have preferred a steeper angle here. The screen itself is clear, contrasty and has excellent color, making image review a pleasure and composing with the rear LCD easy. On the down side, the rear screen is not touch sensitive, and it’s a feature that the A7 could use, as moving focus points is more difficult than I’d prefer with the buttons. The menu system also seems like it could use a touch interface well, with clearly denoted tabs that beg to be touched. The A7 screen also seems to lack an oleophobic coating, as fingerprints and smears are extremely visible. Great review, thank you. The Winter Street photo gave me the feeling I was walking there myself. That’s an interesting comment, ” the feeling I was walking there myself”. I’ve noticed that some shots, usually made on a full frame camera, with a lens around 35 – 50mm, have a look that you feel you could just walk right in to the scene. They have a certain sense of depth that’s hard to convey in two dimension (a photo). Anyone else see that? Why do they look that way? Put it like this way: it is a bit like listening a well-recorded music in audio system, which being set-up really well. When you listen to something like this, it is a bit like “being there”. The larger sensor, the better. So this effect you are talking about is even more apparent with images taken by a medium or especially large format cameras, they really give an even stronger 3D effect from a still image. By the way, thanks for the review Jordan, very well-written. Thanks for your review! One suggestion: It would be great if you could also add the used aperture to your sample pictures ???? A question since I. Can’t browse the other reports on mobile: do you see the WB as similar to the Nex cameras? I would welcome a comparison or opinion of how the Sony A7 compares to the Olympus OMD EM1 and Fuji X-E2. and don’t have rangefinder lenses? Your opinion would be welcome. I’m actually working on an opinion piece that covers many of these things. Look for it in the next week. 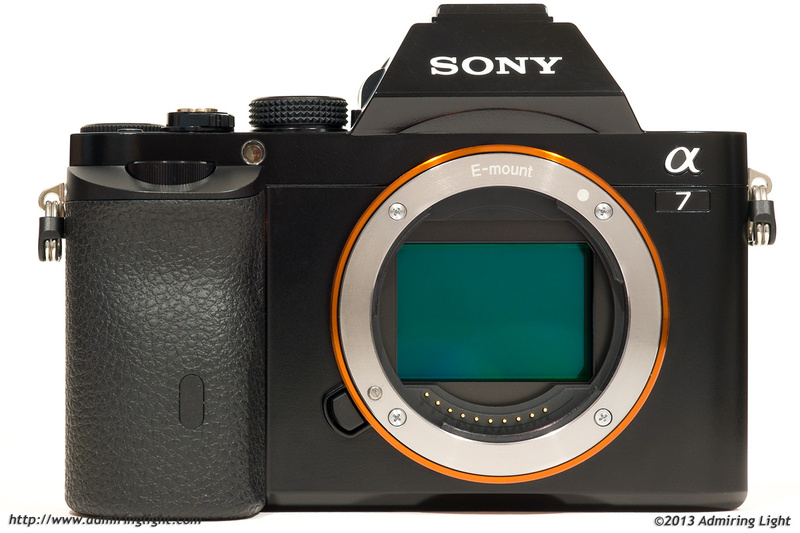 I had a X–E1 in the past but didn’t like the AF and slow response… I hope this is better with the A7(r)? Would go to the e-m1 but I’m really loving very small dof… really like the sunset photo here!!! Really surprised the jpeg quality of the A7 is that bad…is this better via Raw and lightroom conversion? 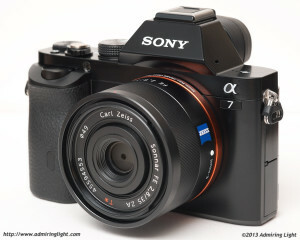 I’m thinking to change my NEX 7 by this A7, but maybe !?? it’s much better to wait for the Sony news il the early of january. What adaptors were you using for the Rokinon and Vivitar lenses (canon mount)? Jordan – The A7 does not have IBIS, which, to me, is a “Con”. And that shutter noise – forget it. Prediction – I bet we will see the class-leading Oly 5-axis IBIS licensed to Sony and incorporated in the next version of the A7. But, for me, the bottom line is that I’m sticking with my Oly E-M1, Pany GX7, and Fuji X-E1. Nice review. Thanks. Hello. I hope you can help me. I have an A7 and I also am seeing squiggly lines in the noise. They really look like little hairs and lint etc. When I take two identical sequential pictures, the squiggly lines and specks do not remain in the same place. They are definitely unique to each exposure. This does not happen at ISO 100, but is very visible at 1600. I had a Nikon d5100 that did not have this problem. The noise was uniform, and got courser as ISO increased, but was composed of uniform graininess, not little squiggly hair looking lines. This noise shows up in my raw files IDENTICALY. I shoot raw+jpg and the exact same noise will be in each exposre. At first I thought this could not be sensor dust because it is different with each exposure, but then it occurred to me that if the shutter is opening and closing with each exposure, it could be moving little hairs and specks around on the shutter. Any info you have on this phenomenon would be great, because I have not heard of this weird looking noise on any other camera. Also, do you know if the a72 has same problem? And also what about a6000?